Unlimited Professional Services provides striping and pavement marking services to give your Greensboro, NC property a positive first impression that will impress your customers while providing safe and compliant parking areas. 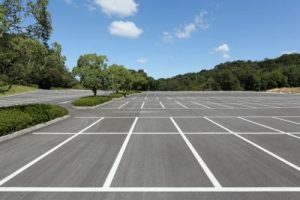 Our Greensboro NC parking lot striping professionals use high-quality painting equipment and only the highest quality traffic marking points. All surfaces are properly prepared to ensure the best adhesion. Greensboro is known as a fun city in North Carolina with over 135 attractions and is located in North Carolina’s beautiful heartland. Greensboro is a great place to relax, work and be immersed in entertainment. Greensboro boasts over 500 restaurants and plenty of places to have fun and enjoy life. Enjoy life in Greensboro with more than 87 accommodations to choose from. All of our crew members have experience lining parking lots in Greensboro NC. We pride ourselves on creating lines that are sharp and straight. We closely follow the requirements of the ADA to make sure your business is in conformity. We recognize that store front parking is an important consideration to whether your company gets the sale over your competitors; that is why the crew at Unlimited Professional Services is the best around. When it comes to line striping parking lots, we understand the rules and regulations put forth by the ADA inside and outside and will happily explain the codes and why we did what we did. We are an one stop store for all of your parking lot needs. A new asphalt parking lot has a beautiful, dark black color, but in Greensboro NC the oxidation process begins immediately which, over time, causes the pavement to slowly turn into light gray color. This oxidation process can by quite intense because it seeps deep into the pavement and the small agents used in the asphalt, such as sand and gravel, becomes loose and eventually taken away by wind and rain. 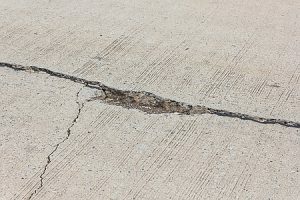 As a result, the pavement area becomes rough and cracked. Sealcoating is the ultimate answer to help prevent oxidation. From repairing a simple pothole in your Greensboro NC parking lot to completely restoring the surface of your entire asphalt parking lot to fixing a damaged curb, Unlimited Professional Services is the one to call for asphalt concrete repairs. The parking lot to any office or store location is one of the more important aspects of a business location. People don’t like visiting a location that has a bad parking lot, such as one that is old, cracked or has a lot of potholes. You don’t want to lose business on account of your parking lot, that is for sure! It’s hard to ever truly be ready for a snowstorm, especially down here in the south where we just aren’t all that use to it. As beautiful as a nice snow is, it can and usually does cause so many different problems. Snow showers around here tend to be rather heavy. If you need to get your parking lot and Greensboro storefront areas cleared of snow so that you can open up, we’ve got you covered. Trying to remove the snow yourself can take hours on end and you’ll probably only make a dent. We can get you cleaned up and ready to go in a very reasonable amount of time! So, when you’re snowed in and need help, call Unlimited Professional Services!